Will bubble blowing be next? The sidewalks on Rehoboth Avenue are looking a bit more uncluttered this past weekend after code enforcement warned merchants last week that signs and products must be kept off the public sidewalks. "The City ordinance states that freestanding signs are not allowed on sidewalks, nor is merchandise and products," City Manager Sharon Lynn pointed out. Private benches, flower baskets and newspaper racks are apparently not impacted by the recent action. The city had considered regulating newspaper boxes in years past, but former Mayor Sam Cooper said that Greg Ferrese, former city manager, had the city solicitor begin to draft a newspaper box ordinance several years ago but it became "hard to tie restrictions to defensible public purposes. It could be an ugly spectacle to have to defend such an ordinance in federal court," he said. Bubble blowing by businesses, which had gotten attention last summer after a neighboring merchant had complained to police, still continues from the Rehoboth Toy and Kite Company. Rachel Webster, the owner of the Rehoboth Toy and Kite Company, and her business partner, Bee Linzey, asserted at that time that they have the same rights as the general citizen to blow bubbles in public. "It is not illegal to blow bubbles in Rehoboth," Linzey pointed out. "Anyone can buy a bubble blower from our store, walk outside and play with it. So the town shouldn't prohibit us from doing the same because we also sell them. No more than they can say that the person who sells bikes can't ride a bike on public property or that the person who sells pizza can't eat a slice of pizza on public property." But City Manager Lynn disagrees. Bubble blowing or product demonstrations on public property are not permitted, she stated this past week. Despite that, Rehoboth Toy and Kite Company personnel continue blowing bubbles including these this past Friday. "Nothing new to report for us," Webster said this past Saturday. "We have been doing the same thing for years and are mindful of all the strict city regulations. We have no interest in any controversy at all and just plan to keep doing the best we can with what we have." Interesting too, this sign on the roadway continues to stand in the second block of Wilmington Avenue, as it has for years. Rehoboth Beach police investigated a complaint that a couple, presumably homeless, had set up camp in the woods to the rear of the Verizon building on Rehoboth Avenue. Police nabbed the couple early Saturday evening when they returned to their encampment. The man was taken into police custody because he apparently had an open warrant. But the woman was free and encouraged to pack and leave. A 28-year-old man from Dover led police on a chase through downtown Rehoboth Beach after police say he was seen skateboarding on the boardwalk this past Wednesday. The suspect was arrested and charged with misdemeanor offenses for resisting arrest and criminal mischief. Just before 7:30 p.m., police say the man had been skateboarding north on the boardwalk toward a patrol officer at Rehoboth Avenue. When the officer attempted to stop the suspect, police say he turned around and fled south nearly "colliding with a group of people before exiting the boardwalk onto Wilmington Avenue where the officer lost sight of him." The officer radioed for assistance and a bike officer was able to locate the man, still skateboarding, inside First Street Station. Even though he was ordered again to stop, the suspect fled west on Wilmington Avenue. The officers caught up with him again at 2nd Street where another officer in a patrol car helped pursue the suspect, who was now on foot, down the second block of Delaware Avenue where he was finally captured. Police later identified the suspect as Robert D. Kellam II. He was released on $1100 unsecured bail. Skateboarding is illegal on sidewalks and streets in the City of Rehoboth Beach from May 15 through September 15. Furthermore, skateboarding is prohibited at the bandstand, boardwalk and pavilions or at any other public structure throughout the entire year. Repo-man snatches one vehicle right off ocean block of Rehoboth Avenue! It had been an interesting week for tows from downtown Rehoboth Beach. This past Wednesday, parking enforcers located two vehicles that owed the city hundreds of dollars. Around 3 p.m., this red Lincoln MKX was found in the ocean block of Baltimore Avenue. The owner owed the city $780 in fines. The driver returned as the tow truck arrived, was unable to pay the fines plus the tow company's show-up fee, so it got towed. About 75 minutes later, parking enforcers nabbed another wanted vehicle. This one, another SUV, was in the second block of Rehoboth Avenue. The owner owed the city $645 in unpaid fines. He returned to the SUV and was able to make the payments before a tow truck was dispatched. On Friday, this Ford work van with utility trailer left parked on the roadway was reported on Scarborough Avenue-Extended near the intersection of Coastal Highway around 5:45 p.m. A tow truck was summoned to have it removed after attempts to contact the owner failed. Later Friday, around 10:30 p.m., a Chevy was repossessed from a parking space on the ocean block of Rehoboth Avenue. When the owner returned and contacted police, they were instructed to contact the lender for information. Saturday's deluge was just incredible and hit Ocean City particularly hard. Somewhere between a foot or two of water was responsible for stranding multiple motorists on Coastal Highway. This was especially true between 123rd to 127th Streets, although serious flooding was reported elsewhere in town as well as into Delaware especially along Lighthouse Road. See the WGMD Facebook page for details. After Saturday's storms, this rainbow could be seen over the beach areas that evening. The choppy seas this past Wednesday brought this sub-adult loggerhead sea turtle to shore at Baltimore Avenue in Rehoboth Beach around 1:35 p.m. Dean Dey, a MERR Institute volunteer, examined the remains while lifeguards dug a ditch in which to bury the turtle. No word yet on a cause of death but it was decomposed. Suzanne Thurman, MERR Institute executive director, says her organization this past week had received reports of a small dead whale, which she suspects is actually a dolphin. She said it was in a remote area and they had not examined it as of yet. They were also trying to examine another dead dolphin reported to be in the marsh but only access is by boat. The choppy seas this past week certainly did not help. The beach replenishment project in Bethany is almost in the same spot where it began just days ago in the north end in front of the Addy Sea building. See this news report for more on the project. The Delaware Office of Highway Safety (OHS) kicked off its "Pedestrian Safety at the Beach Campaign" at the Sussex Family YMCA in Rehoboth last Monday. The event also marks the start of pedestrian enforcement period from June 5 through June 19, part of a month-long grassroots initiative designed to build awareness and educate the public about pedestrian safety at the Delaware beaches. This summer OHS and its partners have developed a multi-pronged approach that includes enforcement, education, outreach and working with corporate partners. 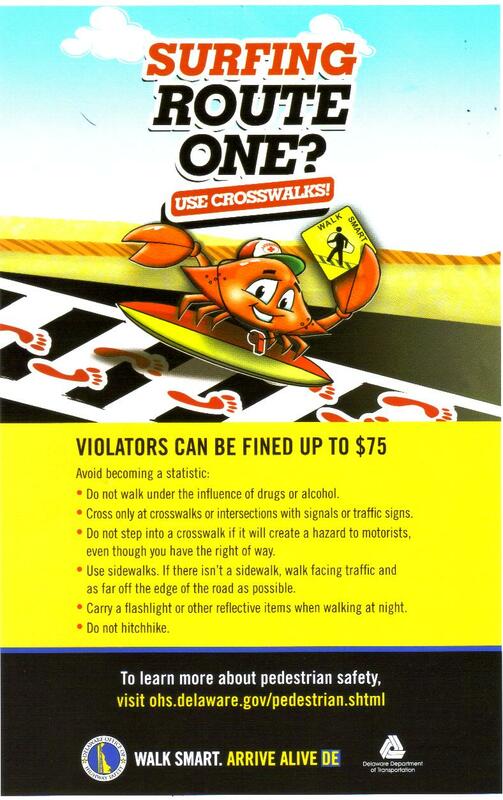 OHS is asking police to conduct overtime enforcement on pedestrian safety, particularly in the beach area. This past week, Rehoboth Beach police officers have already been handing out this flier written in English and Spanish along Rehoboth Avenue warning pedestrians about various dangers. But it is not just pedestrians that need to be careful. "Both the drivers and walkers are cautioned to put down the cell phones since the electronic distractions are seen in increasing numbers of pedestrian crashes," warned Rehoboth Beach PD Chief Keith Banks last Monday. "Other factors for drivers include unsafe speed, and failure to see and yield to pedestrians in crosswalks and in intersections," he observed. "For pedestrians, the major dangers are jaywalking and thinking they can be seen at night especially while wearing dark clothing," Chief Banks added. OHS says its "street teams" will be at the beaches at various venues through the week of June 18, distributing glow-in-the-dark bracelets, key chains and reflectors for pedestrians to use during the summer months. Hundreds of law enforcement officers, athletes from the Special Olympics and their supporters gathered at the Rehoboth Beach Bandstand Wednesday night to attend the kickoff ceremony for the 2018 Delaware Law Enforcement Torch Run for the Special Olympics of Delaware. Attending the Wednesday kickoff was Aaron Olicker, a City of Newark police officer, on his sixth year in the torch run, with his best buddy, Jonathan Stoklosa, who is a boxer, swimmer and weightlifter. "He holds a lot of world records and he is an inspiration to me and everybody who meets him," Officer Olicker said. Stoklosa has been a Special Olympian for years and holds a lot of world records. "He is just a great guy! We love coming down every year and seeing the citizens come out and support a great cause, the Torch Run, Special Olympics, law enforcement. It's just a great partnership and we love doing it every year," Olicker said. The 3rd annual Rehoboth Beach Goes Red, White & Blue got off to a promising start this past Saturday, but by around 1 p.m., participants were packing up as storms were approaching. The event, now in its third year, is a salute to police, firefighters, paramedics, military and all those who serve. This year's displays included some interesting vehicles of historical significance such as this still-working 1943 Sperry 800 million candle power carbon arc searchlight. See this YouTube link for more on the event. Leah Beach, a local artist and co-founder of the Dewey Artist Collaboration, opened her most recent show, IN-DANGERED, at Gallery 50 this past Saturday to coincide with VegFest 2018. Her paintings depict 17 of the world's most endangered animals. This is Beach with "Sudan." He was the last northern white rhino male who recently died. "With his death," she explains, "they are extinct now and that is 100 percent our fault. All of these animals that are in here are all going to be potentially extinct in our lifetime," she warns. Beach says she created this exhibition to showcase these vulnerable animals and to emphasize why it is so important for us to take care of our planet. Deforestation, poaching, climate change, among other reasons, are why the animals are like this. The exhibition is more of a statement, she points out. She puts the animals in the vibrant colors with lush backgrounds to show them in "kind of a regal way like a respectful way, how they should be." Incredibly, she has been painting for only three years and painted this show in the week leading up to Saturday's exhibition. She was originally a photographer who frequently travels the world and has quickly mastered painting. Her technique is special in that the paintings look much like watercolors, but are actually not. For this particular series she used a wooden canvas painted with white acrylic paint. Then she mixes dish soap with acrylic paint in water and blows bubbles with it to create the interesting layers and sense of depth. "I always wanted to do this collection," Beach adds, noting that she is donating a portion of the sales to the World Wildlife Fund. Gallery 50 is at 50 Wilmington Avenue in downtown Rehoboth Beach. Her work will be on display and available for purchase through June 21. One of the latest art venues in Rehoboth Beach is the new city hall which opened its most recent exhibition this past Wednesday morning. The "SNAP Rehoboth art exhibition" features the work of 5th graders from the Rehoboth Elementary School who used iPads and smart phones to take photos around Rehoboth Beach. "This is just spectacular," Mayor Paul Kuhns said. "It is just amazing the eye of these young individuals to be able to pick something out and take the pictures!" Mayor Kuhns says the city hopes to have more similar exhibitions, noting that the Rehoboth Art League and Coastal Camera Club have already had artwork on display in city hall since its opening. "This is a beautiful public space," Mayor Kuhns added. "People are walking through here all the time, so why not put something up to catch their attention?" Shown is Mayor Kuhns with Olivia Steele, Kellyann Ranieri, TerriAna Slayton, Alex DeEmedio, Savannah Montgomery and RBPD Chief Keith Banks. The exhibition will remain on display in the city hall atrium through July 27. DID YOU MISS LAST WEEK'S REPORT? A few readers wrote who did not receive last week's report. It should arrive in your mailbox between 9 a.m. and 9:30 a.m. Please check your spam, promotions or other folders and add this report's e-mail address to your address book or white list. If you continue to have trouble please write. Thank you. ONLY 3 FILE FOR 2 REHOBOTH BEACH COMMISSIONER SEATS--- As noted last week, only three candidates -- Richard Byrne, Patricia Coluzzi and Gary Glass -- had filed petitions to run for the two soon-to-be open commissioner seats. No other candidate had submitted petitions by last Monday's 4:30 p.m. deadline. So far, only Glass has scheduled a public meet-and-greet for Saturday, June 16. Please e-mail him to RSVP. Neither of the other two candidates have announced any public events as of yet. UMBRELLA BOX SET ON FIRE IN O.C.--- Fire investigators in Ocean City are investigating the suspicious fire of a beach umbrella box in front of the Braemar Towers-South building at 131th St. Witnesses reported several groups in the area in the hours leading up to the fire, which may have been ignited earlier that evening. The fire was extinguished by firefighters around 2:45 a.m. Anyone with information regarding the fire is asked to call Deputy Fire Marshal Heather Stevens at 410-520-5490. TODDLER PULLED UNCONSCIOUS FROM O.C. HOTEL POOL--- A 2 or 3-year-old girl was pulled from the swimming pool of the Holiday Inn at 66th Street around 11:15 a.m. last Friday. She was initially reported as unconscious and turning blue. The girl later regained consciousness and was taken to the hospital. Ocean City seeks "beauty spot award nominees"
Teen arrested after motel staff finds large amount of drugs in O.C.